International schools often advertise that they offer a “competitive salary,” or that they pay “on par with other international schools”. We’ve all seen the ads. Actual figures are rarely posted. 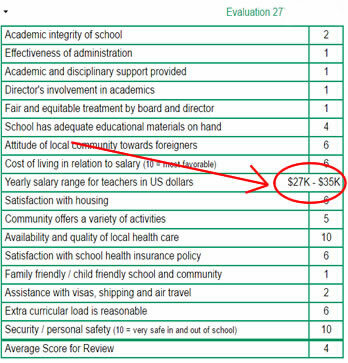 To help resolve the problem of concealed salary scales, ISR has added a Salary Range field to our 16-point evaluation rubric that accompanies each comprehensive international school review. Comments: I have been at this school for three years now. The truth be known I would have to say………..